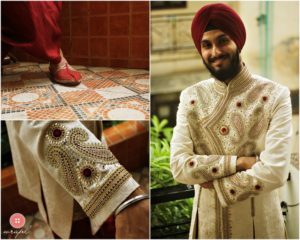 A lehenga is the perfect attire to style at your friend’s wedding but the task of finding the perfect lehenga is a big one. 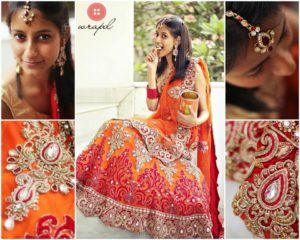 Both bride and bridesmaids can rock lehenga on a wedding as infinite varieties and designs are available in market of this traditional apparel. Comprising of an ankle length skirt, a veil and a bodice called choli, a lehenga is the right pick for an elegant feminine look in an Indian wedding. Keep your body shape in mind and only go for a lehenga that perfectly flaunts your curves. Slender girls can go for a mermaid lehenga while chubby girls can opt for an A-line lehenga. Don’t go for heavy embroidered lehengas if you are looking for a subtle feminine look. Choose fabrics such as chiffon, velvet, net and silk for a royal and luxurious appearance. Shape of the choli matters a lot too. Sleeveless cholis with dori designs at back will make you look scintillating. 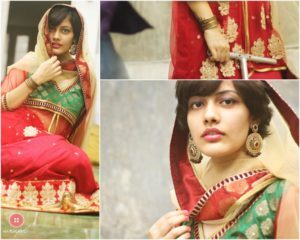 Talk to Wrapd designers for any tip on getting a lehenga on rent. Fill our enquiry form or give a call on 9778-101-102 for any questions or suggestions. Ritu you are going to hate me for this 🙁 The title itself is so bad. Could they have thought what Delhi thought? Could they have done what Delhi was doing? Why did they do what they did ? Why did they not do what Delhi did ? Social and economic price paid by Hyderabad? Social and economic price paid by Delhi ? Was it intelligence that was required to succeed or something else ? Can people with ordinary intelligence make it or do you need extra ordinary people? What is it that differentiates a wannapreneur from an entrepreneur? The conclusion is yours to draw. The cart man turns up. I have to pick some magazines. We decide to meet at metro station. He starts. I start. I cross him and wave. I pick up the magazines and reach metro station. I sit and wait for him at CCD 🙂 The irony. I get a call and ask why he hasn’t reached. He has reached and is at gate 4. I try and locate gate 4. There’s one on the other side. Across the road. That can’t be! I ask for pillar number. He’s at 235. He’s at Shadipur. I’m at Patel Nagar metro station. We’re both at metro station. We’re both not at the same metro station! Communication! In blistering summer heat I reach Shadipur metro station. The cart rim has broken ! I sit guard at the cart. The cart man goes to get the rim repaired. He takes 3 hours! He spends 120/. I dip into the reserve and reimburse. The tubeless tyres are a liability. The tyre rims are of poor quality. We’ll have to replace them. I’ve yet another problem on my hands. Anyhow the man appears. He has already taken a lunch break. I return home to take one. We decide to try our third location at East Patel Nagar. So I’ll meet him in one hour at East . One hour later I’m there. At last. We’ve found our place. It’s decent. It’s not very noisy. I’m still on the road though. My immediate neighbours are a mehendi wallah and 3 ice cream vendors. They’ll be my friends for as long as I’ve to sit at the cart. Maybe one year. We are committed for one year. Cart management is my responsibility. Also anyone can see what I’m doing. I’m in full public view. There’s no hiding behind. I wonder how many start ups will do this kind of penance. They hide behind. They’re not proud enough of their idea. They themselves don’t believe in it. No doubt it affects my self worth and respect but it’s work and has to be done. Delivered. Period. No excuses accepted. It disturbs our relationship. Our peace. What to do? If it’s my house I have the right to do what I want. If it’s her house she has the right to do what she wants. Whose house is it? I’ve a problem on my hand. Strained relationships. Now what? Do I stake the house peace or my trust? What’s more important? Relationship with in laws or trust of Ritu and Anubhav ? Who should be a priority? Is there a way to balance both ? How? Why bother balancing both? Why not quit? I’ve the excuse. We haven’t spent much money or time. Ritu and Anubhav think it’ll be easy, I know, KNOW, it’s going to be hell. Why go to hell? Is it so important? We’re doing well with Wrapd….. I don’t use the excuse. The team will either deliver or die trying. The second requirement of building a sustainable successful business. Willingness to innovate. There’ll be problems galore. You’ll have to innovate your way out.